A mechanical monster grabs the F-14 fighter jet and chews through one wing and then another, ripping off the Tomcat's appendages before moving onto its guts. Finally, all that is left is a pile of shredded rubble. The Pentagon is paying a contractor at least $900,000 to destroy old F-14s, a jet affectionately nicknamed "the turkey," rather than sell the spares at the risk of their falling into the wrong hands, including Iran's. Within a workday, a $38 million fighter jet that once soared as a showpiece of U.S. airpower can be destroyed at the Davis-Monthan Air Force Base in Tucson, Ariz., the military's "boneyard" for retired aircraft. "There were things getting to the bad guys, so to speak," said Tim Shocklee, founder and executive vice president of TRI-Rinse Inc. in St. Louis. "And one of the ways to make sure that no one will ever use an F-14 again is to cut them into little 2-by-2-foot bits." Among other tactics, middlemen for the countries misrepresented themselves to gain access to the Defense Department's surplus sales or bought sensitive surplus from U.S. companies that had acquired it from Pentagon auctions and were not supposed to allow its export. Investigators also found some sensitive items accidentally slipping into surplus auctions rather than being destroyed as they were supposed to be. In an unusual move when dealing with retired aircraft, the Pentagon is trying to shut off all avenues for Iran's parts purchasers by demolishing the F-14s, then combing through the scraps to make sure nothing useful remains. Iran is the only country trying to keep Tomcats airworthy. The United States let Iran buy the F-14s in the 1970s when it was an ally, long before President George W. Bush named it part of an "axis of evil." Shocklee's company won a three-year, $3.7 million contract to render surplus equipment useless for military purposes. The work includes the recent demolition of 23 Tomcats in Arizona, accounting for about $900,000 of TRI-Rinse's contract. The military is considering using the same process on its other F-14s. The company has developed portable shredding machinery so the Pentagon can have sensitive items destroyed on a base instead of shipping them long distances to be shredded. The Tomcat was a strike fighter with a striking price tag: roughly $38 million. By the 1980s it was a movie star with a leading role in the Tom Cruise classic "Top Gun." But as the planes are mangled into unrecognizable metal chunks, the jets with a 38-foot wingspan appear small and vulnerable. The shearing machine, which uses pincers to rip apart the planes, weighs 100,000 pounds. The shredder is 120,000 pounds. An F-14 weighs about 40,000 pounds. Among the shredded victims in Arizona: a plane flown by the "Tophatters" squadron, which led the first air strike in Afghanistan when the U.S. invaded in October 2001. The Pentagon retired its F-14s last fall. At last count, the military's boneyard in Arizona held 165 Tomcats, believed to be the only ones left out of 633 produced for the Navy. The others were scavenged for parts to keep others flying, went to museums or crashed, said a spokeswoman for the air base, Teresa Vanden-Heuvel. 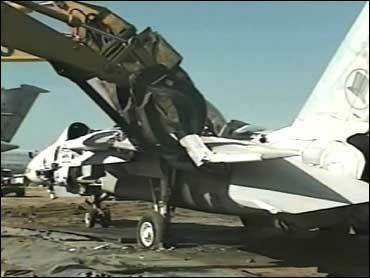 As powerful as the grinding machinery is, not all of the F-14 can be shredded. The landing gear — built to withstand the force of slamming onto an aircraft carrier's deck — must be cut by hand with a demolition torch. It's made from steel with parts of titanium, so the shears cannot cut it and the shredder cannot chew it. Democratic Sen. Ron Wyden considers the F-14 demolitions a good effort, but wants to go further and outlaw the sale of F-14 parts to anyone except museums. Wyden sponsored legislation that also would ban export licenses for F-14 components, which he believes will be more effective than Pentagon policies that he said have changed over time. "I don't think internal rules — these internal initiatives — based on the track record of the Department of Defense, are sufficient," Wyden said. The House passed similar legislation in June; a Senate vote is expected later this summer. The White House hasn't said whether Mr. Bush supports the idea. F-14 preservationists said the Pentagon is handling the Tomcats they obtain differently. As a Navy pilot, retired Capt. Dale Snodgrass delivered an F-14 to Iran — flying nonstop from the United States with roughly No. 68 of about 80 planes that Iran ordered. Snodgrass said only key computers were taken out and ejection systems disabled on planes delivered to museums in past years. This year, when an F-14 went on display at a Miami museum, virtually everything was removed, leaving only a shell with the canopy painted black, said Snodgrass, who lives in St. Augustine, Florida. Snodgrass is part of F-14 history. He flew Tomcats for roughly a quarter-century and amassed the most flight time in them of any pilot: more than 4,800 hours. He was named Navy pilot of the year around the time "Top Gun" hit theaters. Snodgrass said he understands the Pentagon's destruction of F-14s but said it would be nice to see some preserved. Pilots dubbed the Tomcat "the turkey" because of its ungainly, turkey-like look when landing on aircraft carriers. "When I first started it," Snodgrass said, "it was the biggest, the fastest, the most impressive, the most maneuverable fighter on the planet Earth."